Endodontics is the branch of dentistry that deals with the inside of the tooth. The root canal consists of the blood supply, nerves, and lymph tissue. When a tooth is fractured and bleeding, the pulp is exposed and painful. That tooth will die of endodontic disease. To prevent pain and infection, a root canal is recommended to preserve the tooth’s function and control further infection. Root canal therapy provides a solution to fractured teeth, discolored teeth, or abscessed teeth that would otherwise have to be lost due to extraction. There are many reasons that our patients may need oral surgery. The most common oral surgery our veterinary dentists perform is surgical extractions. In cases where periodontal surgery is not indicated, the teeth affected by advanced end stage periodontal disease may be treated with extractions. Our dentists evaluate each tooth to determine attachment loss, bone loss, and mobility. Fractured teeth are another indication for possible oral surgery. If a fractured tooth cannot be saved with root canal therapy, extraction may be the best choice. If a tooth has significant structural loss as in a dissolved or resorbed root, the extraction may have a better prognosis for healing and health than root canal therapy. Another reason for extraction may be severely worn teeth with pulp and nerve exposed. The open canal contains a blood supply and nerve. These open pulp canals will lead to infection. Oral surgery incorporates the diagnosis and surgical management of a variety of diseases. Our board-certified veterinary dentists regularly perform advanced oral surgery procedures in both the Lenexa and Mission office. The doctors perform procedures such as cleft palate repair, oral tumor surgery by maxillectomy or mandibulectomy, jaw fracture repair, oronasal fistula repair, dentigerous cyst treatment, temporomandibular joint (TMJ) luxations, surgeries of the tongue, and full mouth extractions to help improve conditions like feline stomatitis. Just like people, veterinary patients can be affected by cancer. Some cancers are best treated with surgery, while others respond to surgery coupled with radiation therapy or chemotherapy. Due to the subtle differences between and specific to oral diseases, our doctors collaborate with leading oral pathologists to get a quick and accurate diagnosis. We use a multimodal approach to pain control to make your pet as comfortable as possible with any oral surgery procedure. This can be as simple as oral pain medication to overnight hospitalization for pain management at our Mission office. Our doctors take pride in communicating with you and your primary care veterinarian about your pet’s health status. Feel free to contact us if you have any questions regarding your pet’s oral health. We are happy your primary care veterinarian referred you and your pet to Companion Animal Dentistry to have our doctors perform oral surgery on your pet, because we believe that gives you the best chance to make a dramatic difference for your pet. The surgeries can be involved, but also very rewarding. We can help alleviate a lifetime of pain, chronic nasal infections, and even make them free of cancer. Orthodontics in pets is not intended to create a “Hollywood” smile, but rather prevent painful diseases and preserve teeth to allow for a comfortable pain free bite. There are many conditions that are painful and destroy bone and supportive structures of teeth due to orthodontic problems. Examples of these conditions are linguoversion of the lower (mandibular) canines that can lead to oro-nasal fistulas and infection. 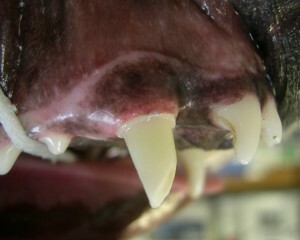 Most linguoverted (base narrow) canines can be moved to a location that prevents soft tissue trauma and provides a pain free comfortable bite. 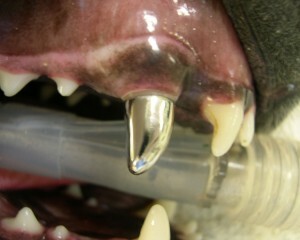 In some cases where the base narrow canines do not have room to move to another position or if the canines are locked directly beside, also called medial to the maxillary (upper) canines, then a procedure called a vital pulp therapy with crown shortening can provide a comfortable bite. Similar to dentistry in humans, dental conditions can be inherited like occlusion, jaw growth patterns, and missing or malformed teeth. Each occlusion and dental pathology is unique to the individual and an examination and full mouth radiographs will be necessary to determine the best treatment for that animal. Functional dentition and and a “pain free bite” is the goal. There are three basic skull types, dolichocephalics, brachycephalics, and mesocephalics. These skull types are inherited and passed down between breeds. Call our office today 913.742.8686 to schedule your consultation and genetic counseling sessions with one of our board certified dentists. Pre-purchase examinations are also available. Prosthodontics involves restoration and replacement of teeth with crowns, bridges, and implants. In dogs and cats, the teeth can be restored with direct composites chairside or impressions can be made and a dental lab can fabricate a full metal crown to protect and preserve the function and shape of the natural tooth. Full metal crowns are commonly placed after root canal therapy to prevent re-fracture of a tooth. Full metal crowns can be placed on worn or fractured teeth to prevent further wear or abrasion. 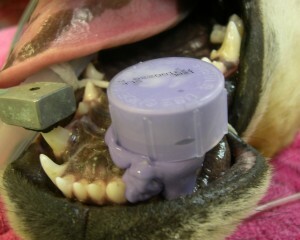 Step 1: The tooth (canine in this photograph) is prepared for impressions by a veterinary dentist. Step 2: Detailed impressions of the prepared tooth are taken and sent to the lab. Step 3: At a second visit, the customized full metal crown is cemented to the tooth. Full metal crowns can help protect dogs from breaking teeth on wire crates, cages, or as a result of separation anxiety and thunderstorm phobias. Your pet can expect to enjoy the benefits of a full metal crown for his/her lifetime. Home care of a crown is similar to any natural tooth. Your pet can eat normal dry kibble and enjoy chew toys. Our feline friends deserve special care. Cats are independent creatures and tend to keep to themselves. They may hide, have decreased interaction with the family, and sleep more when they are experiencing oral pain. Signs of oral pain in cats, if they demonstrate any signs, may include dropping dry food once they have started eating, growling at the food bowl, crying, running away from the food bowl, excessive drooling, increased vocalization, bloody saliva, bad breath (halitosis), decreased appetitite, or preference for softer food. Our Staff is trained to deliver anesthesia safely and calmly to our feline patients. We design your cat’s experience tailored to his or her needs. We incorporate pain management drugs in our pre-medication to ensure support “pain free dentistry.” Please feel free to contact our office to learn more about safer anesthesia. In addition to dogs and cats, other animals can suffer from dental disease. Ferrets can have fractured teeth. Pocket pets get periodontal disease, like sugar gliders with gingivitis. Guinea Pigs can get oral infections. Zoo animals can also have fractured teeth, abscessed teeeth, and gum disease. Hedgehogs can have oral tumors. As with any species, early detection and diagnosis can improve quality of life and provide several treatment options. Ferrets can suffer from periodontal disease and fractured teeth. 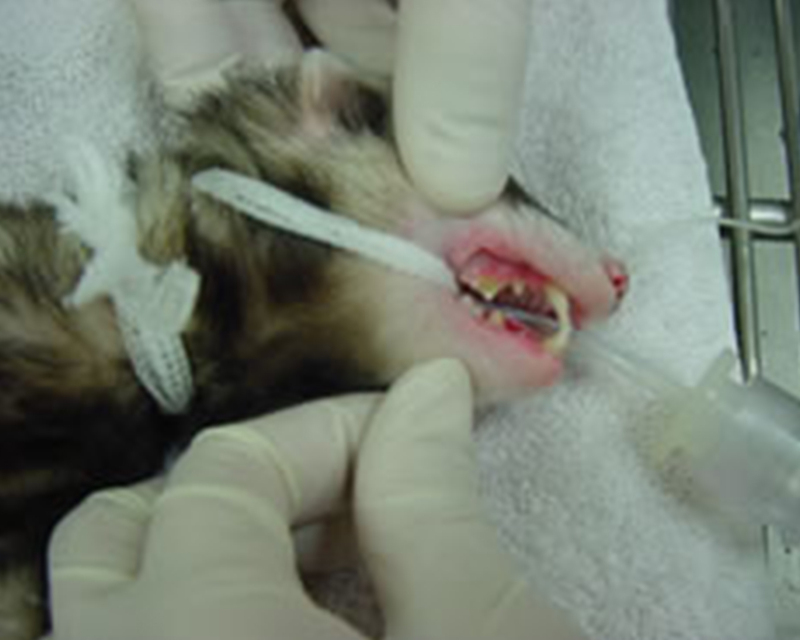 Ferrets can benefit from regular dental prophylaxis visits and oral exams. After a a dental prophy, your ferret can be trained to accept tooth brushing with time and patience. With continually growing teeth, malocclusions are common in the rabbit, guinea pig, and other rodents. Our veterinary dental specialists have extensive knowledge about which periodontal therapy would be best for your pet. In treatment planning which periodontal surgery might be best for your pet, an accurate diagnosis is needed. The severity and extent of periodontal disease can only be determined by intra-oral radiographs and probing depths. In the early stages of periodontal disease, closed root planing and subgingival curettage might be the only treatment necessary. In more advanced cases, our board certified veterinary dentists can make gingival flaps for open root planing, guided tissue regeneration and bone grafts to help restore the periodontal health to functionally important teeth. Unfortunately, in the most severe cases extraction may be the best and only option. Each case and tooth is treated on an individual basis, because there are many different factors that affect the outcome of periodontal surgery in our veterinary patients. Treatment options, prognosis for success, and need for follow-up examinations will be thoroughly discussed with you, so you can make an informed decision. Our doctors regularly go to human and veterinary dental continuing education meetings to stay up-to-date on the the most advanced, cutting-edge periodontal surgeries available to your pet.